Annette O’Neil and Joel Strickland made their skydive jump over Arizona, performing an incredible air dance before pulling their chutes. 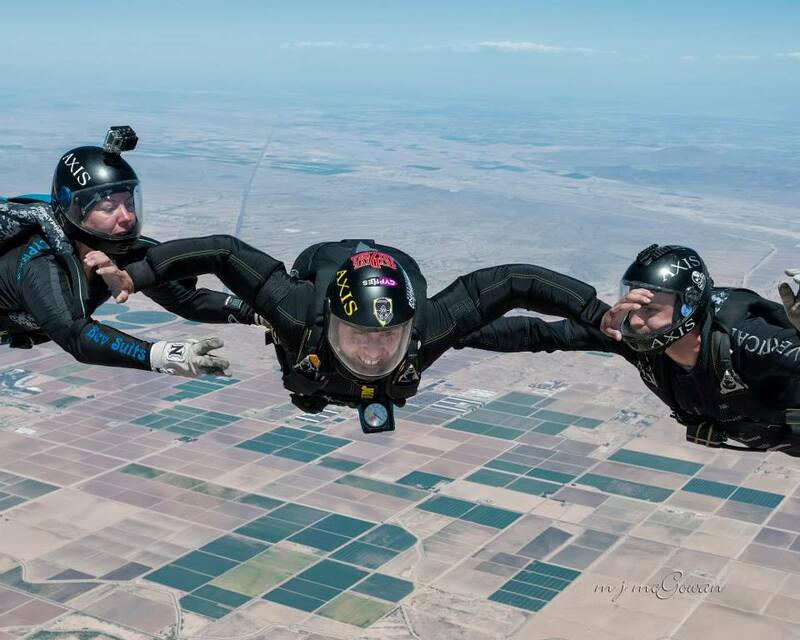 They also completed jumps in New Mexico, are currently headed to Nevada, and eventually, they plan on making skydives in all 50 states (even Alaska and Hawaii) over the next six months, making it the first time the challenge has been completed in one fell swoop. But they’re not just making these jumps to set a record, they’re also raising money for Operation Enduring Warrior (OEW). The organization’s goal is to honor, empower, and motivate wounded vets. To tell us more, Annette and Joel joined our RTM hosts in the studio, along with Brianne Thompson from Axis Flight School, who partners with OEW to teach veterans to skydive. It has been over a year now since AXIS Flight School got to meet and jump with Todd Love (USMC veteran who lost both of his legs and his left hand to an IED in Afghanistan). 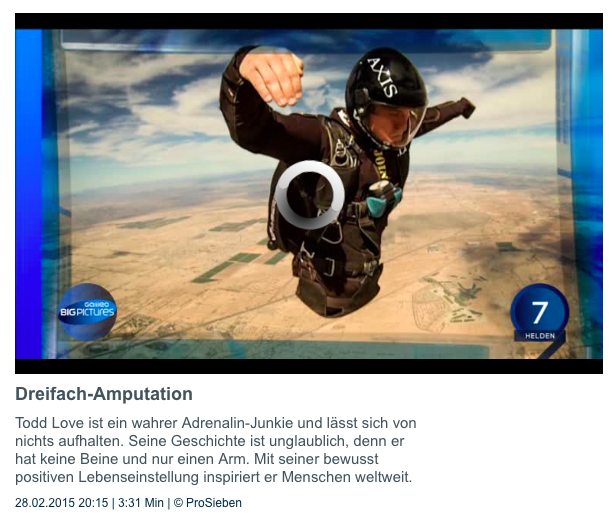 On Saturday 28th February 2015, at 08:15, ProSieben (a German television channel) featured some of Todd’s video footage flying over Skydive Arizona on the show “Galileo Big Picture”. 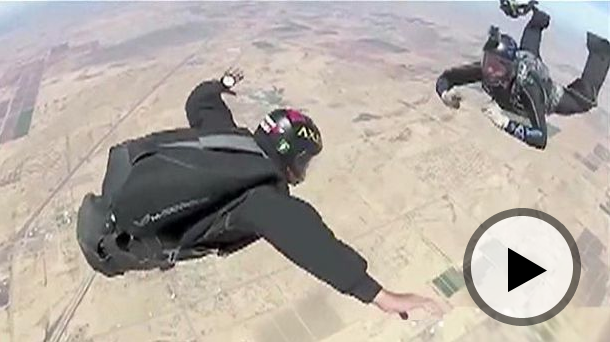 Unfortunately the segment can not be viewed in the US due to country code laws, but here is a screen grab of Todd rocking out in the head up flying orientation over Eloy. Originally posted on the Performance Designs Blog. Operation Enduring Warrior – Skydive is a non-profit organization that works to empower wounded veterans by helping them to achieve Extreme Goals. 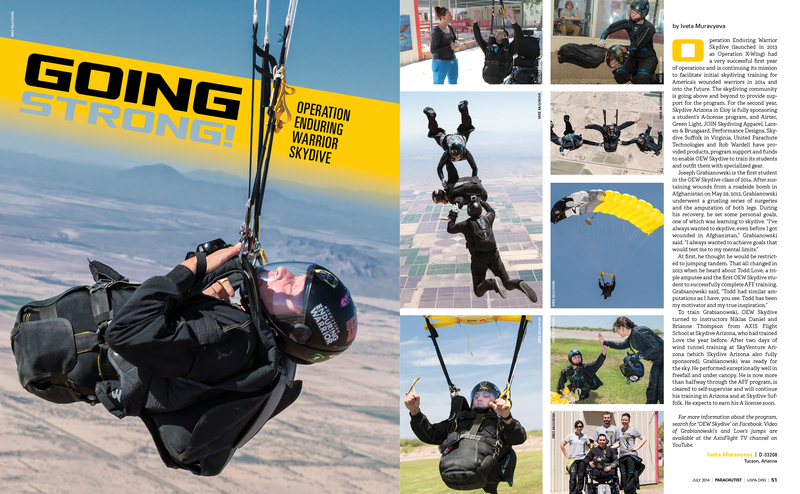 Operation Enduring Warrior has seen a number of inspiring veterans welcomed into our sport and skydiving family. Most of us have seen the inspiring images of Todd Love and other wounded warriors that have gone through AFF training and continued to become licensed skydivers. Axis Flight School has been a big part of this training, and has helped these wounded warriors to fulfill their personal goals of becoming licensed skydivers. We sat down with lead FS coach for Axis, Brianne Thompson, to better understand the challenge of choosing the appropriate canopy for these new skydivers. “As with all things, there is a learning process. We take our best educated guess, try it, then assess the next best course of action. In some cases, you wing it. In the case of the Spectre 170, when it was first sent to us for Todd Love, I was a little bit concerned that it would be too small. I was expecting a Navigator 200. I tend to be on the conservative side of things, and putting a student, regardless of their size or body shape, on something below a 200 seemed a bit out there. Granted, it was a complete emotional response; I had no scientific evidence of that being bad, just that “we’d never done that before”. Dangerous words, to be sure. So, when the Spectre 170 came I was a bit skeptical, but Nik felt confident that it would be awesome. He did a test jump and we agreed that shorter brake line length would be critical in order to preserve the arms and hands of Todd. We needed the canopy to flare at or above his belly button, rather than past his hips. Once the brake lines were shortened, we were ready to go. Todd did his first couple landings with the confidence of someone who had done that before, and as someone constantly trying to learn their canopy. It was actually pretty exciting to watch. The landings were soft and forgiving, but the power of the Spectre had yet to reveal itself. After several jumps, Nik figured it would be time to follow Todd under canopy in order to get some pics. Nik jumped the Pulse 190, thinking that that had more glide and size than the Storm and he would be all set. What was amazing was that because of Todd’s lack of legs, it affected how he hung in the harness and it directly affected the glide of the canopy. Todd sat in the harness much like a paraglider pilot: he reclined in the harness. With the combination of the recline, and the lack of drag on his legs, the Spectre had more glide than the Pulse! A surprising amount more. Article published in July 2014 issue of USPA Parachutist. Although an IED attack and severe infection left Army vet Joe Grabianowski in a wheelchair, he never gave up on skydiving. Grabianowski’s motivation was Todd Love, a Marine Corps vet who lost both legs at the hip, along with his left hand to the mid-forearm. Operation Enduring Warrior is a volunteer group, set up a year ago this month, that introduces high level amputees – who can’t be fitted with prosthetic limbs – to extreme sports, including skydiving. Grabianowski trained at a wind tunnel in Arizona, learning to balance despite missing both legs. Then he moved on to tandem jumping, before going solo. “For me it felt exhilarating,”Grabianowski said. Like anyone else, he was a little apprehensive when it came time to go out of the airplane door — but it was worth it. While he can’t walk, during free fall, he said, he felt liberated from his injuries. 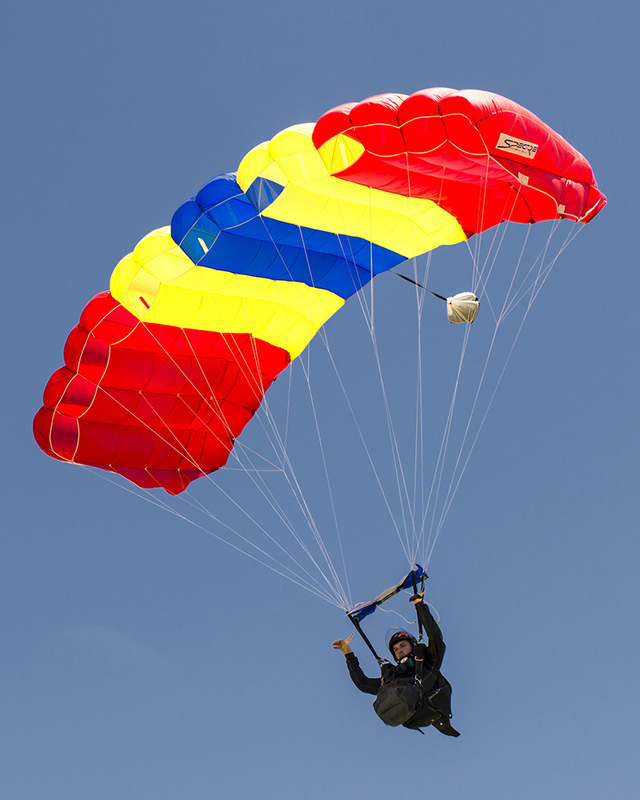 Drop zones and wind tunnels in Arizona, Texas and North Carolina are donating training and jump time. It’s about paying it forward, how one vet can inspire another. Grabianowski is out of Walter Reed, and looking for work helping other vets in the DC area. He recently turned down a custom home to accommodate his disabilities because he wanted to earn it on his own. Both he and Love said skydiving is a confidence builder. “It makes me wonder what else, what else is possible?” Love said.